Concerned about Hair loss - Receding hair line ? Why don't you a try a medically proven, economical and state of the art new and improved Hairbelle II laser comb produced by the finest Korean manafacturer having more than 30 years of experience in Beauty and Cosmetic industry delivering products mainly to Germany and the rest of the Europe ? Order the Laser comb Hairbelle II today and STOP the balding areas, treat your hair loss and start the hair growth. Send us an email TODAY and you will receive the order form and payment instructions. Products are new and come with 1 year warranty. Hairbelle is a low level laser irradiator for care of modern person's Hair follicle and Hair scalp care which is vulnerable or damaged by various hairstyling agents, frequent dyeing, perm, air pollution, stress etc. Within weeks you will experience lesser hair loss and within 2 - 3 months better and thicker hair growth. Hair count rate has increased by 55,2 % at women and 74,1 % at men. The laser device induces positive physiology to scalp and hair root cells, and continues the health of hair and scalp. One of the main functions of the Hairbelle is wound healing so it can be used if you are experiencing itch, hair scalp inflamations, crust or flakes. What is the function of a Low Laser Therapy? -Induce and accelerate the circulation of the blood. -Provides enough nutrition to the scalp without damage. -Causes rapid hair growth by increasing the circulation process of the follicle. Micro current low frequency gives fine stimulation to scalp, and causes massage effect through continuous contraction and relaxation of scalp cells that stimulates pilar cyst and increase blood flow rate. Therefore, without patting the stimulation pole to scalp, physical massage effects can be secured only by contacting the pole to the scalp. How does the Low Level Laser work? In 2003 it was reported by Mr. Santino that all of the men and women who took the clinical tests show significant increase in number of hair and tensile strength of pilar cyst. Make normalize the cell function increase of intracellular ATP synthesis, acceleration of cell division and increase of protein synthesis. Through bio stimulation effects, Low-level laser helps vasodilation, blood flow rate increase, smooth microhemocirculation, and cell growth for regeneration. The optimal laser treatment is delivered to scalp and hair because the device is equipped with 650nm wave length pulse laser, the most popular laser in clinical application. It is designed under the most demanding ergonomic concept. It is very convenient to carry so Hairbelle can be used anywhere and anytime. There is no need for cable during the operation as the Haibelle works with internal battery. Stimulating the scalp by safe micro-current, Hairbelle gives physical massage effect in condition of keeping it on the scalp without the inconvenience of patting with stimulation bar. It can be conveniently usable with only time and stimulation rate setting. Simple home use - no training necessary / no 240 pages booklet to be read before the first use .. The cost is affordable and the results are visible after 2 - 3 months. The warranty period is 1 year. CE conformity. The Hairbelle is completely safe, no adverse side effects had ever occured. 1. 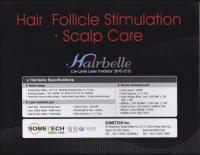 Hairbelle is the latest products of that kind on the market - therefore most advanced. 2. The penetrating depth of Hairbelle is deeper than of the competitors. 3. The laser used in the Hairbelle is technically one of the best safe LLT lasers available on the market. 4. The material used for the teeth of the comb is not made out of plastic - so there is no static electricity. 5. Hairbelle is packed with advanced functions such as : automatic timer function, connection through the charger - so there is no risk of electric shock, you can carry it in the hand luggage so it is always available .. The product comes with a 12 ( twelve ) month manufacturer warranty against defects. The product can be replaced at no cost in the event there is a manufacturer defect during the 12 months. Returns for any other reason will not be accepted. There is no implied guarantee as to the results you will achieve from using the product. Please do consult your physician regarding the use of the product in case of the head surgeries, metal implants in the head, high blood pressure, pregnancy, taking medications for prolonged period of time or you suffer from any form of mental illness. 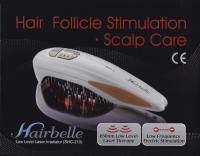 To assure your own Hairbelle Hair & Scalp Low Level Laser device order it online and we will send it to your adress. The price for the EU and the region of Adriatic is lower than one of competitors in EU - and the transport cost is as low as 12 EUR. The price is very attractive - call us for pricing !! Stop the balding areas today - and order it online - just by cliking on the email address bellow the phone numbers. New dealers are always wellcome. Join us and make people smile again!